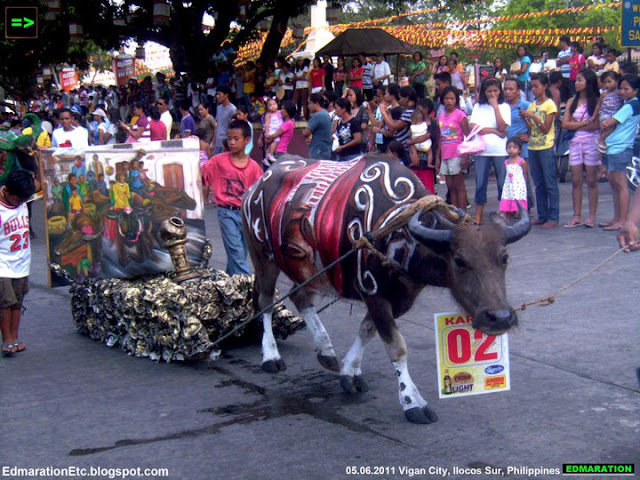 "Carabao, one of the Philippines national symbols plus Vigan, the Philippines' only World Heritage City equals Karbo Festival. Yes, this festivity is formally called as the Karbo Festival." 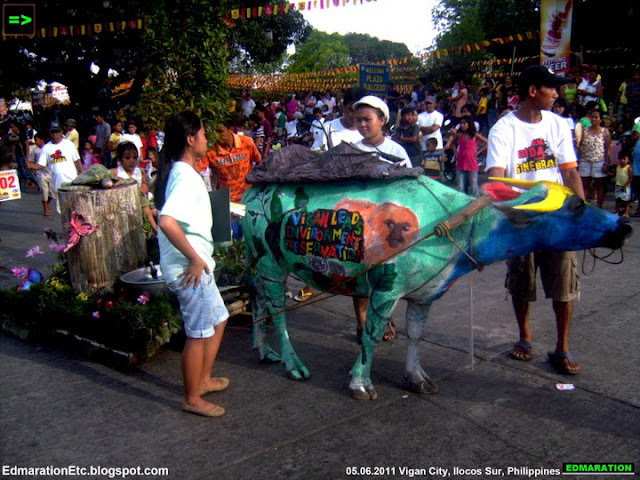 The carabao (Filipino: kalabaw; Malay: kerbau) or Bubalus bubalis carabanesis is a domesticated subspecies of the water buffalo (Bubalus bubalis) found in the Philippines, Guam, Indonesia, Malaysia, and various parts of Southeast Asia. 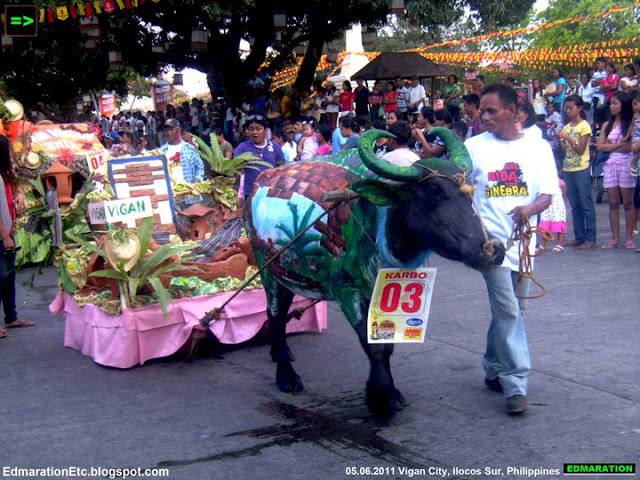 Carabaos are associated with farmers, being the farm animal of choice for pulling both a plow and the cart used to haul produce to the market.By the way, if you want to witness beautiful and colorful festivities in Vigan like no other, the month of May is the answer. 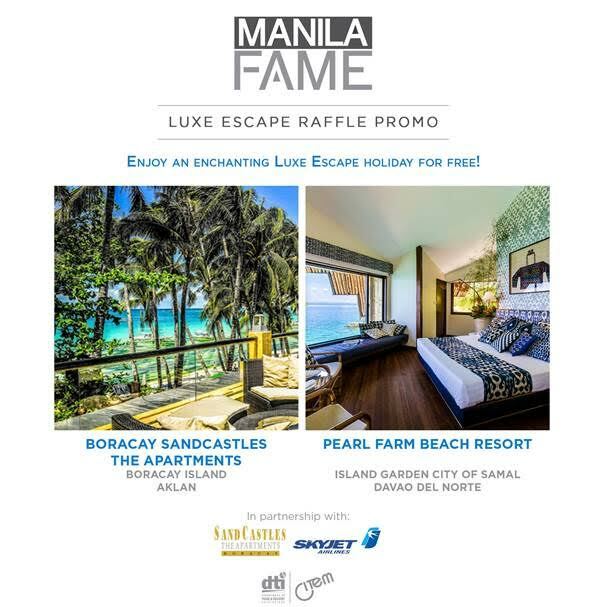 Aside from the annually growing Binatbatan Festival of May, there are also other events you should not miss in your summer May and one of these is the Karbo Festival. 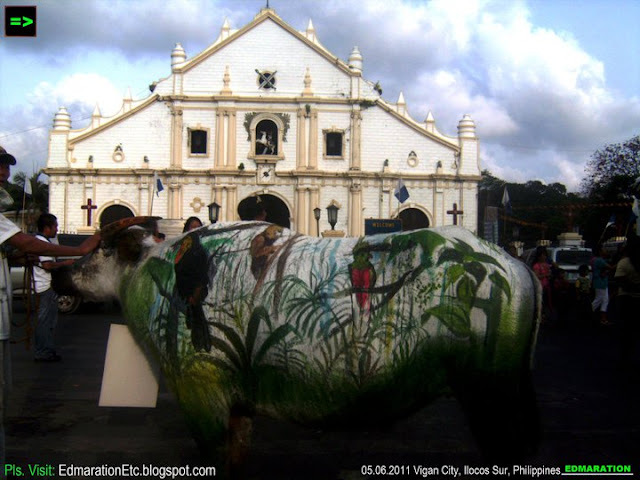 Coming from the Vigan's countryside, all those carabaos gathered at Nueva Segovia St. just around Plaza Salcedo and walked several kilometers going to the venue. There's no other practical way for these carabaos to be sent there except walking. I looked at the program and it must be starting at 7 am so I woke up early to see this. 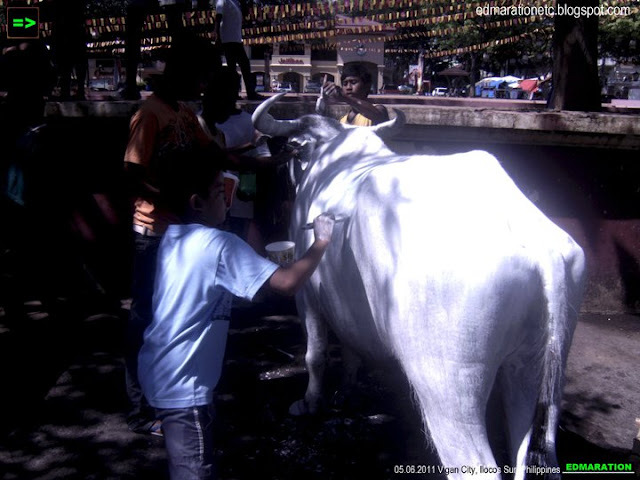 Now, lets see the start of the carabao transformation! 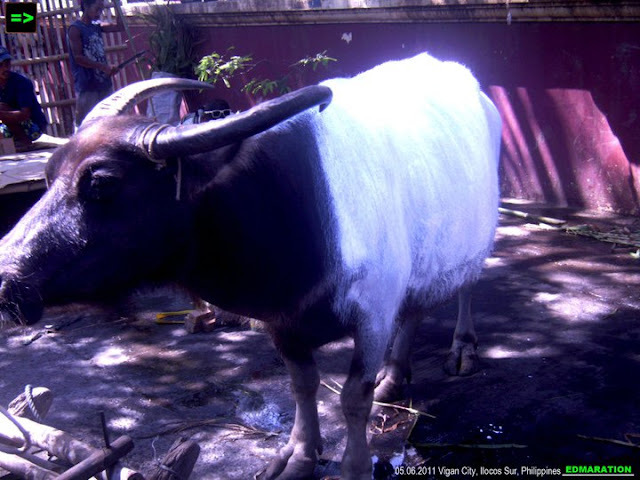 Of course, the first transformation happens upon painting the carabao's dark skin into white and Sixteen (16) hardworking carabaos were displayed at that street waiting for their artists to transform them into a magnificent form of art. The artists need to paint them with white to make them suitable for painting like a living canvass. And of course, black canvass is a painter's ultimate fear - according to some sayings and proverbs. 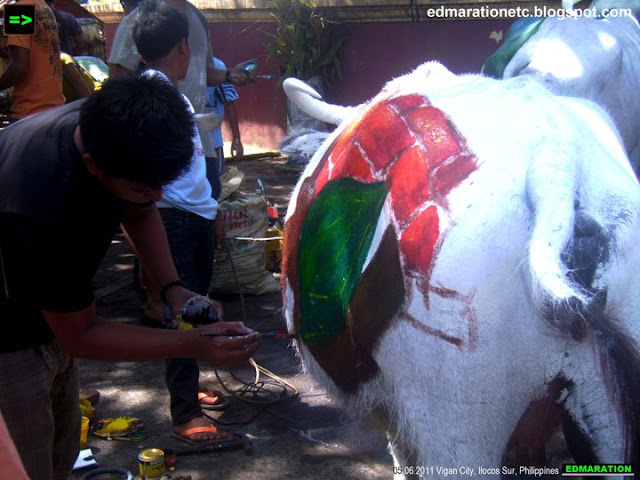 After painting them with white, the artist will now begin outlining his design and eventually coloring the outline with their very creative hands to transform the carabao into a very wonderful piece of living art! You might regard me as O.A. but while writing this article, I feel like crying because I am so touched with the fact that carabaos are farmers' best friend. Can you just imagine how the carabaos are sacrificing by plowing the field under the scorching heat of the sun with its own strength then spending its own whole life working at the field with patience and without any complain? Can you just imagine that? 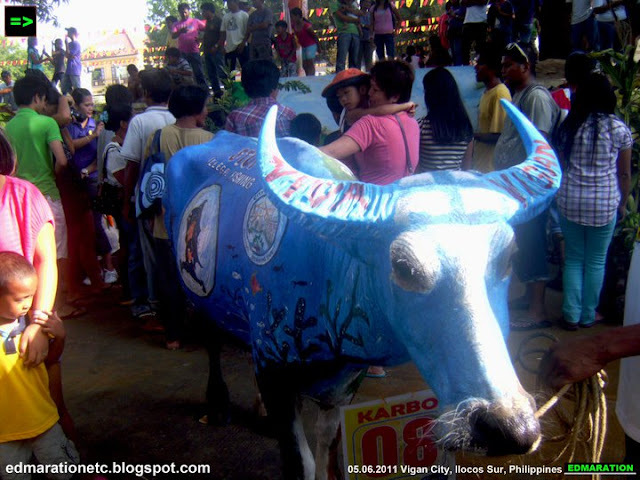 What overwhelms my emotion more is the farmer-carabao partnership which I consider as a heroic tandem! I am so lucky that my dad had a job [although not a high-income job] to support me when I was a kid and that I never have to plow the field for a living. In fact, my dad's family is a family of farmers but all of my grandpa's 9 children, including my dad became professionals. 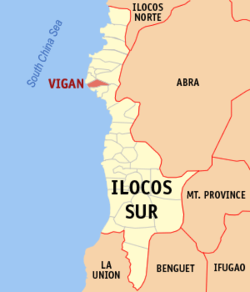 Their eldest is the Regional Director of Philppine Postal Corporation in Region 11 and she represents the country in international conventions. There are accountans, soldier, etc. 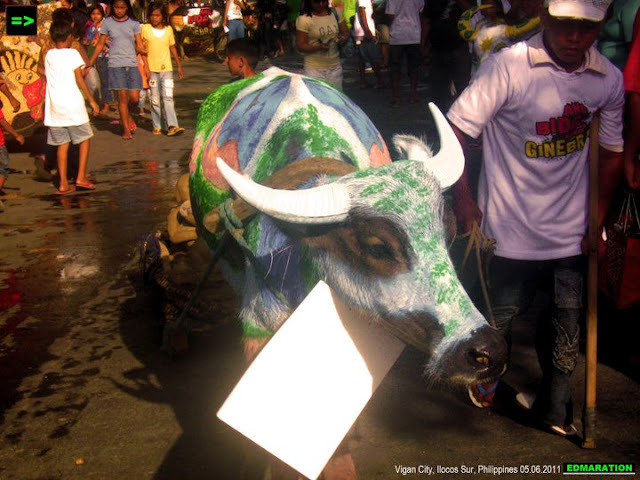 With this, I get so emotional because farmers and the carabaos are heroes! The farmer sacrifices at the field all day long spending all his strengths but sometimes the children and wife have to work too to help their dad. But we should not look and step down to them because the farmers are not doing an illegal work, instead, they are doing a heroic work to survive! At this point, although I never tried to plow the field, I am very proud that I came from a family of farmers and through farming, my dad and the other 8 siblings survived with flying colors! So who are we to tell that the farmers are damn ordinary citizens? Yes, technically, we farmers might be poor and ordinary but it is our sweat and strength that make you enjoy what you are eating right now. Let me wipe my tears. Haha! Ok, enough for that side notes and lets go back to our topic. After 8 hours, yes it was 8 hours, the 16 carabaos are now ready to be displayed and now, lets take a glimpse of some of the finished products. In fact, Karbo #13 ignited a discussion to some Italian Facebook users when I posted it in Facebook and here is the screen shot of their comments. 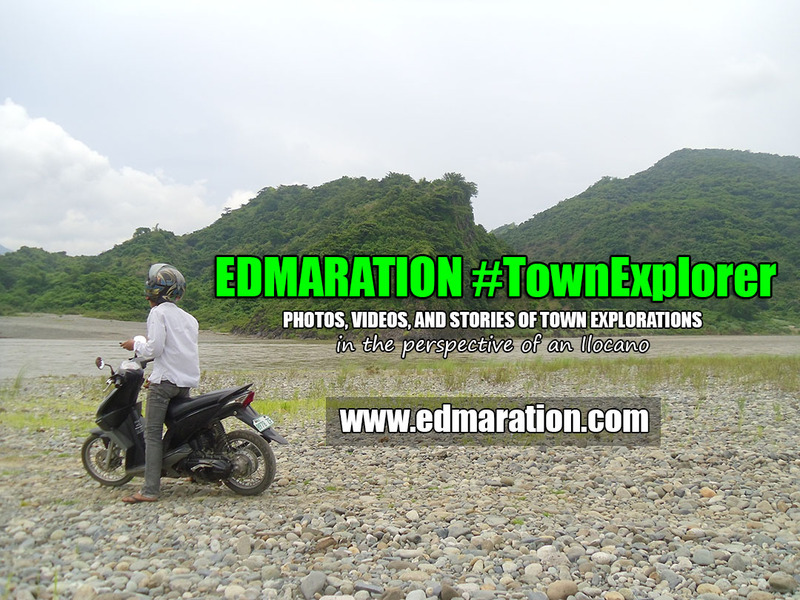 I can't understand what they were telling but one Italian commented on one of my photos in English language telling that she was really impressed and it was her first time to see this kind of activity in her lifetime and she appreciates the Philippines for this. After 8 hours of hardwork, its now time for the parade of these carabaos and they are the stars for the day! In fact, it was a great challenge for the artists to create an art out of these carabaos. Imagine 8 hours of doing so! That's incredible! The perseverance and patience of the painters also reflected the good traits of these carabaos who are all persevere and patient [except for #14 hahaha!] in plowing our fields for us to have food to eat. 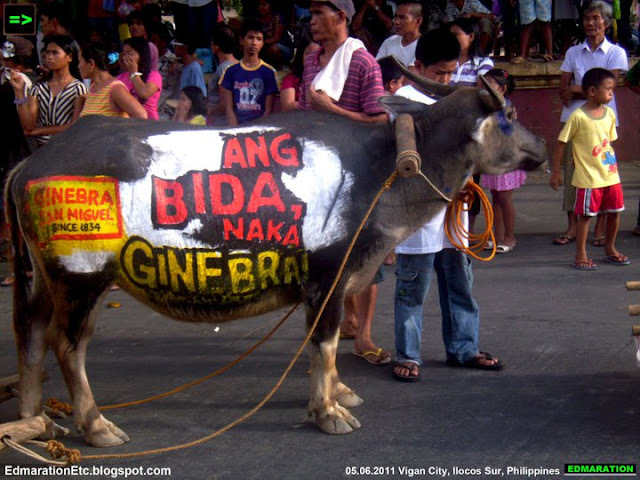 With this, this is a day for these carabaos and I salute them. For me, this serves as a tribute to them giving them recognition as a very valuable animal in shaping the lives, culture and way of life of every Filipino.